It has been a busy spring at Gardiner Marine on St. Joseph Island and they've expanded their product line and services in 3 different ways for 2018. Gardiner Marine has been operating in the area for over 25 years and employs 8-10 people locally during the season. Depending on the weather, that is typically April through December and workers include some summer students. The property formerly Ambeault's in Richards Landing, was purchased by Gardiner Marine last year for the large shop. They did attempt to keep the store open, but eliminated the confectionery store at the end of last summer, as it became clear it was not a profitable venture. 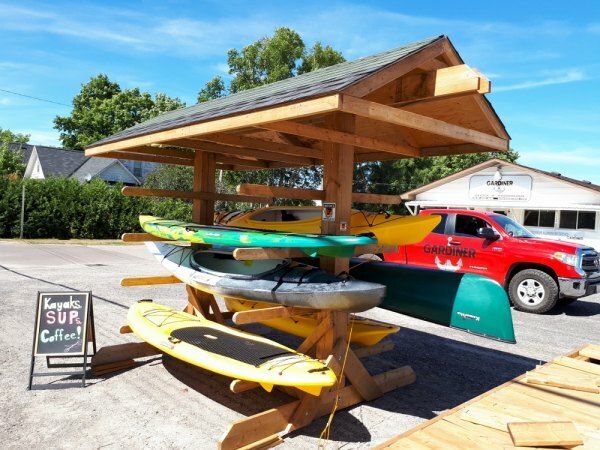 During the off season, the space was converted into a showroom, office, and retail sales location for their new line of water sport products and dock systems. Employee Emma Wildman says "Sales have been going really well for the water sports equipment and we've already had to reorder." 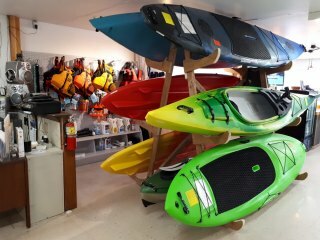 The Clear Water Design line of kayaks, SUP's (stand up paddleboards), canoes, and paddles are all made in Ontario and Gardiner's have a good selection in stock, along with other accessories at the Richards Landing storefront. 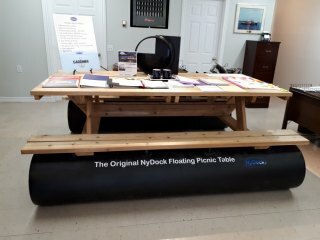 Gardiner Marine is also now a supplier for two dock products made in Ontario, Dock in a Box aluminum pipe docks and NyDock floating dock systems, allowing them to provide more options for their residential customers. In addition, Gardiner Marine has also taken over a cottage care and maintenance business previously run by Lynn Kent Construction Ltd. of St. Joseph Island. Two former Kent employees have been retained to work that division for Gardiner Marine. If you're taking part in this weekend's Kensington Conservancy Poker Run, Gardiner's will have their water sports equipment on site, including a 12x20 dock boat, which is the most unique watercraft around. They've also generously donated a paddling PDF as a prize for the event taking place in Portlock Harbour. For more details click here.